Barcelona is a city with an excellent Christmas and festive tradition that make it an interesting destination to spend the holidays. Therefore, there is no better plan than to welcome the New Year in the Catalan capital, but how and what should we do to celebrate New Year Eve’s in Barcelona? The favorite place of all locals and visitors is without a doubt Plaza de España, Maria Cristina Gardens and the Magic Fountain, as it is there where the epicenter of the celebrations is on the night of December 31th with a big party in which entertainment, music, light and fireworks make the delights of the viewers. But this does not mean that there are no other interesting places to spend the end of the year: from other parties organized in great spots such as Poble Espanyol or Plaza Real; to tailored plans that we can organize ourselves, for example at the beach by the Mediterranean sea or from the top of some of the hills of Barcelona to see the fireworks in a spectacular panorama view. Before having the traditional 12 grapes of luck, the New Year’s menu catches the eye. We can do it in our rental apartment for days of Via Laietana, with breakfast included so that the next day we do not have to worry about nothing, or in any of the restaurants that remain open on this well-marked day. Galets Soup: Galets are big shell-shaped pasta, with a hole in the middle where the meat from the broth goes. “Gall d’indi”: is the Catalan name for stuffed turkey, which in the same way it is done for Thanksgiving, is eaten in Catalonia at the end of the year. Canelones: the Catalan tradition of December 26th (San Esteban) is to eat cannelloni made with the leftovers of the meat of the previous day, but since it’s a very tasty and home-made dish is often eaten on other dates until the December 31st. 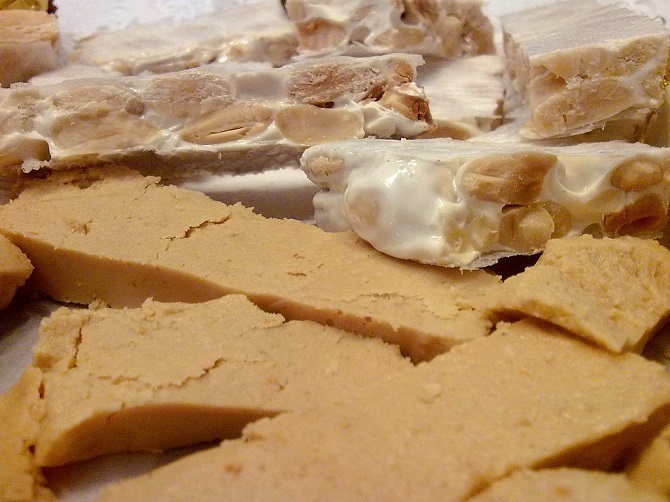 Turrón (nougat): the dessert par excellence comes in a wide variety of sweet bars made of almonds, crunchy chocolate, toasted yolk and many other ingredients. Neules: tubes of fine biscuit that are eaten covered in chocolate, accompanied by rich custards or Catalan creams; or just by itselves. Wear red underwear: red symbolizes love, so wearing intimate clothing of this color ensures a good year as a couple. You must give it to him or her to make it work. Gold into your glass of champagne: throw your wedding ring or any gold object in your glass on the 31st of December and toast with it just after the bell chimes are over and the New Year has begun. It’s a symbolic way to start the year with good fortune. 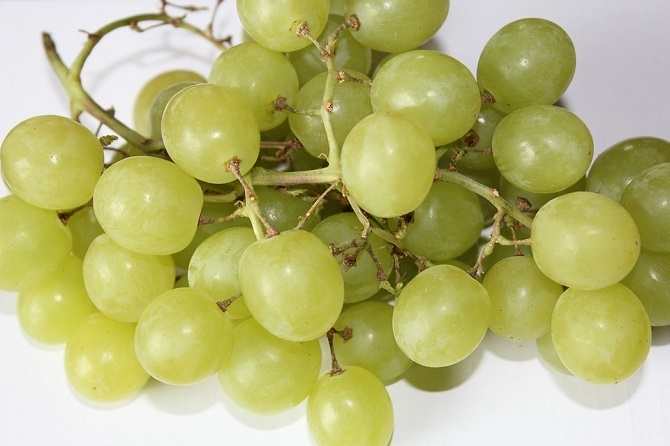 Take the twelve lucky grapes before the last bell chime: the grapes are eaten to the rhythm of the bells to bring luck every month of the following year (although the beginning of the tradition has to do with an overproduction of grapes). Eating them all is a good omen. Watch TV first thing in the morning: every year for the whole of Europe, the New Year’s Eve concert with the Strauss Radetzky March and its contagious clapping are the main protagonist, as well as the ski jump competition from the Alps. Both events are broadcasted every year throughout Europe. It can be a good backdrop to accompany your breakfast included in Muntaner rental apartments. Take the first swim of the year in the Mediterranean: at the beach of San Sebastián every year, a hundred of intrepid bathers receive the New Year with a comforting (but cold) plunge into the sea. Take advantage of the deserted streets: the vast majority of establishments are closed, but it is the perfect occasion to enjoy parks, gardens or monuments with a mesmerizing quietness. Eating churros with chocolate: this tradition doesn’t have much to do with early risers, since it is typical of those who have extended the night and return home, not without recharging their batteries before with a good dish of churros accompanied with hot chocolate or battered in sugar. Something that is certainly appreciated when it’s cold or to ease the impending hangover. No matter which way you choose to enjoy New Year’s Eve in Barcelona, in AinB we’re waiting for you with open arms and looking forward to starting a new season with you. Thank you, Valarie! And you know … for this 2017 we wait for you in your apartment in Barcelona. Regards!